In the 4.0 Division there were two teams from the Sun Valley area. Alma Mills and Gayle Stevenson captained the winning team of the district championships. Others on the team were Joanne Wetherell, Sue Hamilton, Andrea Foss, Chiyo Parten, Diane Bradford, Lisa Cortese, Joyce Allgaier and Suzanne Williams. Coached by tennis pro Chris Gripkey, the winning 4.0 squad had wins over four teams from throughout the Idaho area consisting of Boise, Pocatello and Magic Valley/SV. The Mills team will advance to the sectional tournament in Boise Sept. 23-25. There they will compete against teams from Montana, Utah, Colorado, Wyoming and Nevada. A victory at Sectionals will earn this team a trip to nationals in October at Indian Wells Tennis Center in California. The second 4.0 team from Sun Valley was the Penrose team. Although their team did not fare as well at districts they had a successful season. They defeated Twin Falls four times to advance to the district tournament. In addition to captain Lana Penrose, the team consisted of Jackie McRoberts and Jeanie Paulson along with local talent Dee Bartels, Susan Rippon, Jacque Samway, Joyce Burrell and Sandra Maier. SVEA tennis director Bill Van Deinse coached the 4.0 Penrose team. 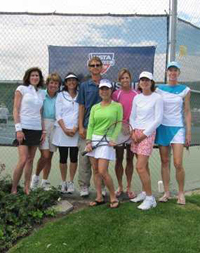 SVEA Homeowners Nancy Auseklis (captain), Wendy Cairncross, Nancy Wasilewski and Lesley Hardy joined other local tennis talent to compete in the 3.5 Senior Women's division. Also coached by Van Deinse, the Auseklis team came in third with wins over Twin Falls and Boise 2. Other members of the Auseklis team were Patty Onken, Judy Powell, Julie Lynn and Donna Kostens.